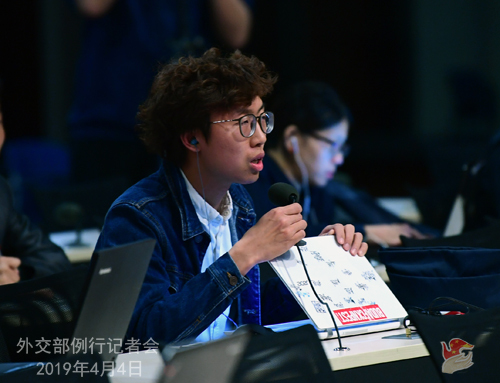 Q: According to media reports, the spokesperson of the American Institute in Taiwan (AIT) in Taipei said on April 3 that the US government has stationed officials including active military personnel at the AIT since 2005. On the same day, a spokesperson of the US State Department said the US follows the one-China policy and that the security of the AIT is maintained by a small US unit and a larger group of local employees and authorities. What is your comment? A: We have noted relevant reports. The US has made unequivocal commitments on keeping non-official relations with Taiwan. China firmly opposes any forms of official and military ties between the US and Taiwan. We have made clear our stern position to the US many times. The one-China principle is the political foundation of China-US relations. The US sending military personnel to Taiwan under whatever pretext constitutes a violation of the one-China principle and the three China-US joint communiques, which will inevitably have a negative impact on the bilateral relations. We urge the US to honor its commitments, strictly abide by the one-China principle and the three China-US joint communiques, correct its wrongdoing and exercise caution and prudence when handling Taiwan-related issues to avoid serious damage to China-US relations and cross-straits peace and stability. Q: Yesterday, China and the Philippines convened the fourth meeting of the Bilateral Consultation Mechanism (BCM) on the South China Sea. Compared with what was achieved in the last three meetings, is there any new progress this time? A: Supported by the leaders of China and the Philippines, the Bilateral Consultation Mechanism (BCM) on the South China Sea was set up in early 2017. It offers a platform for the two sides to discuss measures to enhance mutual trust, properly handle differences, prevent and manage incidents at sea and promote practical maritime cooperation. It has played a significant role in ensuring the steady development of the bilateral relations. Yesterday, the fourth meeting of the BCM was convened in Manila. Like in the three previous meetings, China and the Philippines exchanged views on the situation in the South China Sea, the maritime activities and other issues of respective concerns in a candid, friendly and constructive manner and reached fruitful outcomes. More information on this meeting can be found in the press readout that China issued. First, during this meeting, China and the Philippines reaffirmed that our differences regarding the South China Sea should not affect the mutually beneficial cooperation in other fields. The relevant differences should be peacefully resolved through friendly consultation and negotiation by sovereign states directly concerned. Second, China and the Philippines had a productive exchange of views on strengthening across-the-board maritime cooperation. Without prejudice to our respective positions on sovereignty, sovereign rights and jurisdiction, both sides exchanged views on oil and gas development. Third, China and the Philippines reiterated our commitments to full and effective implementation of the Declaration on the Conduct of Parties in the South China Sea and agreed to maintain the positive momentum of the negotiations towards the early conclusion of a Code of Conduct in the South China Sea, based on consensus. China will continue to work with the Philippines to implement the important consensus of our leaders and make efforts to uphold the friendly cooperation and the peace and stability in the South China Sea. Q: A couple of questions on the ongoing trade consultations in Washington. There are reports out there that President Trump could announce a date for a summit between President Xi and himself. Is China prepared for a leaders' summit if President Trump announces it? I'm also wondering if Vice Premier Liu He's visit has been extended in the US? A: Lately there have been many reports on the next summit between Chinese and US Presidents. Here I'd like to reiterate that as we have noted, President Trump said on many occasions that he very much looks forward to meeting with President Xi who also expressed willingness to keep in contact with President Trump through various means. 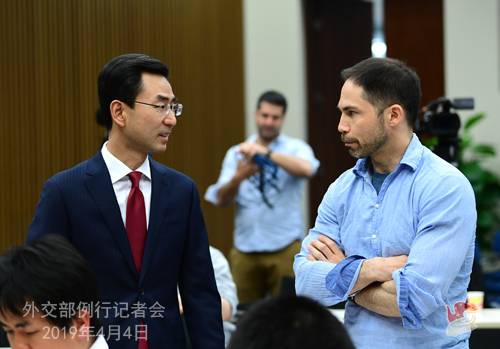 As for your question on the China-US economic and trade consultations, I can only tell you that Vice Premier Liu He is still in the US and the consultations are still going on. Q: I wonder if you have information about a Chinese woman who was reportedly arrested for illegally entering Mar-a-Lago? Also, she is accused of spying by some in the US. Do you have any comment? A: According to the latest updates I have, on April 3 local time, the Chinese Consulate General in Houston received a notification from the US side on the arrest of a Chinese citizen on March 30. The Consulate General then contacted the person concerned and provided consular assistance. Q: The Philippine foreign ministry said the presence of a large number of Chinese boats near the island Thitu (Zhongye Dao) in the South China Sea is a violation of Philippine sovereignty. I want to ask if you have any comment? A: Like I said earlier, the fourth meeting of the BCM was just convened yesterday. During the meeting, China and the Philippines exchanged views on the situation in the South China Sea, the maritime activities and other issues of respective concerns in a candid, friendly and constructive manner. We discussed ways to resolve issues with a cooperative attitude and reiterated our commitments to further cooperation and talked about measures to enhance mutual trust. I believe that the consensus reached by the two sides through discussion in this meeting is the best answer to your question. Q: I'd like to follow up on that question about the Philippines. The Philippines said that the Chinese boats going near that island was illegal and said that if China doesn't disavow the actions of those boats, they would deem that the Chinese government was in support of that. So does China support the actions of these boats? A: Like I said earlier, during yesterday's consultation in Manila between China and the Philippines on the South China Sea, the atmosphere was candid, friendly and constructive. We exchanged views on issues of respective concerns and agreed to uphold a cooperative attitude in resolving the relevant issues. I think this speaks volumes. Q: The Massachusetts Institute of Technology has issued a statement today saying that it has stopped collaborations with Huawei and ZTE because of US investigations into those companies for violating sanctions. Do you have any comment on that? A: You may need to ask Huawei and ZTE for their comments on this matter. 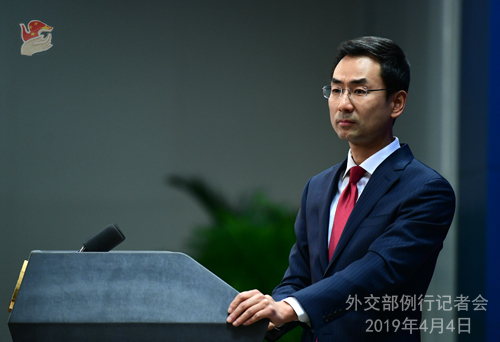 As the spokesperson of the Foreign Ministry, I can tell you that we support Chinese companies in carrying out international cooperation in economic, trade and other fields in compliance with international rules and local laws. Meanwhile, we ask foreign governments to offer a fair, just and non-discriminatory environment for Chinese companies. After the Press Conference, a journalist asked if China is going to offer assistance to Iran for the damage caused by severe flooding. A: I answered a question on the severe flooding in Iran the day before yesterday. State Councilor and Foreign Minister Wang Yi has sent a message of condolences to the Iranian Foreign Minister Mohammad Javad Zarif. China will positively consider providing assistance based on Iran's needs. 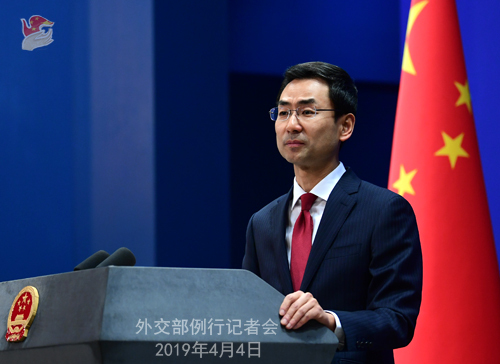 The regular press conference of the Ministry of Foreign Affairs will be adjourned on April 5 (Friday) for the Qingming Festival and resumed on April 8 (Monday). During this period, you are welcome to contact the Spokesperson's Office via phone and fax if you have any question.